Young large and giant breed dogs are particularly prone to a condition called Osteochondritis Dissecans (OCD), which is caused by problems in their joint cartilage. The disease causes considerable pain and lameness and may need surgical treatment in severe cases. However, the incidence of the disease can be greatly reduced through responsible breeding and careful nutrition and exercise of growing pups. OCD occurs when the cartilage, which surrounds and cushions the bones within joints, becomes damaged or grows in an abnormal manner. This results in cracking or even small pieces of cartilage breaking off and floating around within the joint, causing irritation, inflammation and great pain. Several factors contribute to cartilage damage, including a strong hereditary component where certain genetic lines of dogs are much more likely to develop the disease. Thus, parents should be carefully screened for this disease before being used for breeding. Other factors that contribute to OCD include trauma to the joint and consequent restricted blood flow following the injury, rapid growth and over-nutrition. As large and giant breeds are already predisposed to rapid growth, it is no surprise that they show a high incidence of OCD, particularly if they are fed a diet that is too high in calories and put on too much weight too quickly. Males are more susceptible than females, possibly due to their larger size and higher growth rate, and most affected puppies begin showing symptoms between 4 and 8 months of age, although older dogs can also be affected. The main symptom is lameness which shows up in the limb with the affected joint. The degree of lameness will vary with individual dogs and with the severity of their condition – some may only show a slight limp whereas others will hardly be able to bear any weight on the affected leg. If the shoulder joint is affected, this often shows up as a shortened forelimb gait, as the dog is reluctant to flex and extend the shoulder joint. Owners may notice that the lameness increases after a period of exercise and improves after a period of rest. The shoulder joint is the most often affected (74%), followed by the elbow joint and a small percentage in the hock. In rare cases, the disease will affect joints on both sides simultaneously, making the dog very reluctant to move altogether. For proper diagnosis, physical examination and history must be interpreted by a veterinary surgeon. For example, whereas a healthy dog will not be bothered when their shoulder is fully-flexed and extended, a dog with OCD may show great resistance to manipulation and may even cry out in pain. Diagnosis can only be confirmed by the results of radiographs (X-rays). These will show the affected joint (together with the healthy joint on the other side). Occasionally, if X-rays are inconclusive, they can be re-taken in 2-3 weeks. Like many other musculoskeletal problems, treatment will depend on the severity of the condition and can be conservative or require full surgical intervention. Dogs with early mild symptoms can be managed with periods of strict rest (eg. 8 weeks) and restricted exercise (eg. leash-walking only, not running, playing or jumping). This form of treatment can be very difficult with a young, energetic puppy! More serious cases may require medication like anti-inflammatories and painkillers, prescribed by your vet. It is believed that supplements like glucosamine and chondroitin may help the condition but there is no research as yet to confirm their benefits. For dogs with severe OCD, surgery is recommended where the affectd joint is opened and the damaged cartilage is removed. Success rates are fairly high and most animals seem to recover well with any further problems. Like all diseases with a strong hereditary component, OCD can be largely prevented through careful, responsible, selective breeding and the thorough screening of any breeding stock to avoid parents which may be carrying the defective genes. 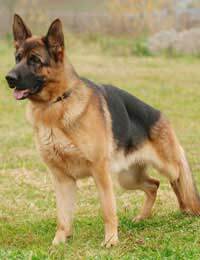 In addition, the exercise and nutrition of young giant and large breed dogs should be carefully monitored. Gentle exercise and a diet that promotes even, sustained growth is the ideal. OCD currently affects 15% of dogs and it is only through good management by responsible breeders and owners that we can hope to reduce incidences of this disease.